As the school year comes to a close, many of the schools I work with are launching into a week or so of in-service, summer institutes, and other professional development. It’s “curriculum season” in many places around the country. 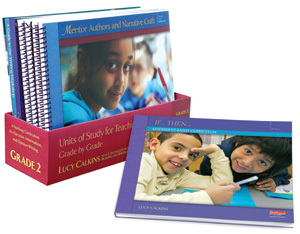 For many writing teachers, that means diving into the Units of Study for Opinion, Information, and Narrative Writing by Lucy Calkins and colleagues. (Click here and here if you’ve never heard of them!) I’d like to share some tricks for reading the units, whether this will be your first experience with the Units of Study, or you’ve been using the units for many years. Full disclosure: I coauthored one of the units, and work very closely with all the authors. Also, my work requires that I teach all the units K-8. The advice below has been gathered from my experience working with teachers in schools across the country. Step 1: Keep an open mind. Seriously. You might think that you are willing to try anything, but then by Session 4 you’re starting to think, “Well I could just change that…” By Session 10 you’re thinking, “Well I could just do this session the way I did it last year…” Then you’ll decide to use a different kind of paper, and you’ll skip this and add that… and by the end of the unit, you’ve actually told yourself that you’re not going to do very much of the unit at all–even though you thought you were being completely open-minded the whole time. Instead, I recommend reading each session with the intention of teaching the session as it is. Then, during the school year, you’ll adapt your teaching to the KIDS, rather that preemptively adapting all the sessions before you’ve even given them a try. Resist the temptation to try to squeeze the new ideas to fit with what you already know, or what you’ve always done in the past. Step 2: It’s not a script. Okay, that’s not really a step so much as it is a fact. The units are written as a guide, a suggestion for how the unit might go. No two groups of kids are the same, and no two teachers are the same, so you WILL need to make adjustments. This might at first seem contradictory to Step 1 above, but actually it’s not. The sessions make it pretty explicit that you can substitute your own examples, your own stories, connections, and ideas. The books are overflowing with advice for how to make each unit your own. Step 3: Think long-term. As authors, we knew that our audience would be rereading the series year after year and we knew that we needed to pack the books chock full of advice about teaching writing, and about teaching in general. With that in mind, each year you might pick a lens with which to read. Maybe your first year, you’ll read just to figure out how to teach the minilessons. Then in Year 2, maybe you’ll read to pay more attention to the coaching notes in the sidebars. In Year 3, you might dive into the suggestions for conferring and small group work, and the charts in the second half of the If…Then Curriculum books (charts you might not have even known existed the first year). Step 4: Read each minilesson. Take notes. This is what I do: I read the minilessons in parts. First I take the “Connection,” and I distill the main point. “What am I doing here?” I think to myself. 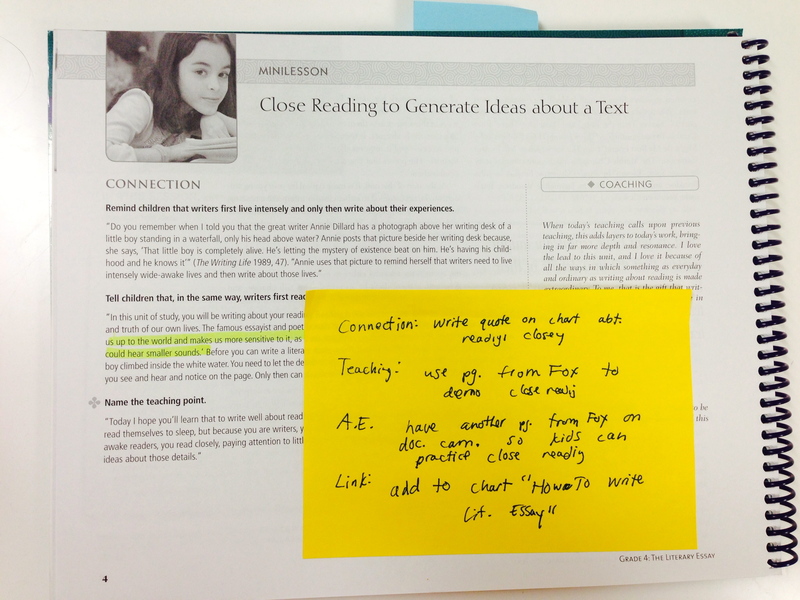 Then I do the same for the “Teach,” the “Active Engagement” and the “Link.” I use a large post-it and make a few bullet points for each part of the minilesson, and that is what I teach from when I’m sitting with kids during actual writing workshop. Reading this way helps me figure out what I’m going to be doing, and then I don’t have to read directly from the minilesson like a script while I’m teaching! Connection, Teaching, Active Engagement, Link. My minilesson plan goes on the post-it. My own writers notebook. 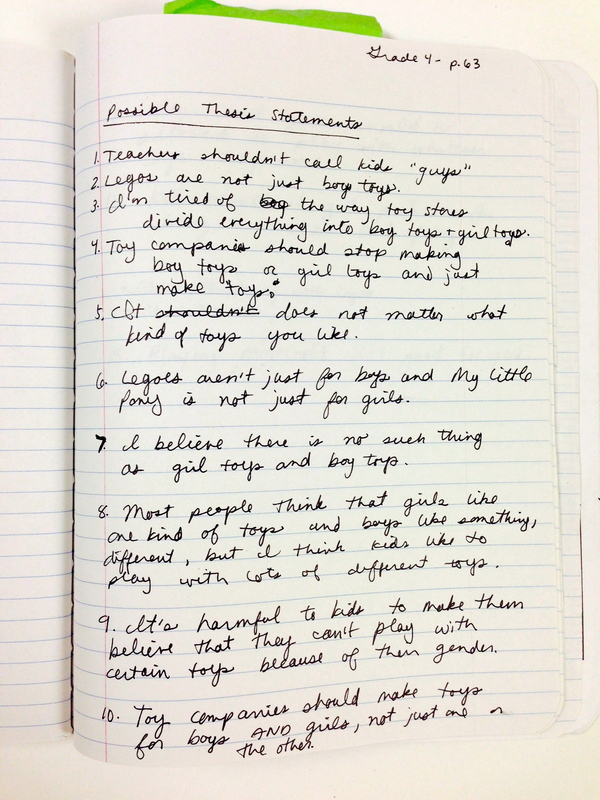 Here, I was trying out possible thesis statements to model for kids. I label each of my entries with the grade level and sometimes a page number or a session title to keep me organized, working in classrooms across grades and schools. However you decide to go about reading the units (or any professional texts) this summer, it’s always better with friends. Recruit some of your colleagues to read the units with you. Maybe you’ll divide up units and then report back to one another. Maybe you’ll all pick one unit to read together. If you can’t get friends to read with you, tell as many people as you can that you’re going to be reading. That way, you’ve committed to it and you can feel great when you’ve accomplished what you set out to do. Happy summer, everybody! May you write lots, read a ton, and come back to school energized and inspired. So important to do the work that the students will be doing! Love that part of the post, especially. I have read many of the UoS, and I am blown aways by the chock-fullness. I ALWAYS learn/ notice/ pick up on something new when I read or re-read one of the books. The If…then books are amazing, as well! The units of study are an acquired taste, but well worth the trudge through. Thanks to Beth Moore for simplifying the trip. Thank you for this post! I used Units of Study for the first time this year and was blown away at how the writing, revising, editing and talking changed in my K-1 class. I am excited to do it all over again with a new “lens” next year. Thanks so much for your steps. We will be integrating parts of the units of study into our current middle school units. I am not sure how this will work with only have one 60 minute period for all things ela (both reading and ela). I am afraid the delivery will be fragmented and that teachers won’t have enough training, but I think it’s a step in the right direction of improving writing instruction. Thanks for the advice. Tara, you said 2 things that I appreciated: the first is that the lessons are “chock full” and I sometimes feel bad because I can’t get it all done (especially the mini lesson!). The second thing is that you recognized that many of us elementary teachers (generalists) have several subjects to teach. And we feel the pressure to be experts on all of them. Thank you for recognizing this. This post is full of helpful advice. Thank you so much for sharing your insights, Beth! Thank you so much. I love the idea of using a lens. Perfect for those who may be overwhelmed for the first time reading it. Thank you. Thank you for the tips. I’ve used the units of study for several years and some of my teammates dove in last year. They were overwhelmed, which was disappointing to me, because I have seen great value in the units of study. I will be taking on the role of literacy coach next year and would love to get some tips on how to approach staff to give it a try again (or for the first time). Thanks! Thank you Elizabeth! Any tips for a coach who is working with teachers new to the reading curricular calendars? What are your recommendations for approaching them? Oh, this is so, so helpful. One thing it makes me realize is I was trying to do way to much with the new Units of Study, which may explain why I was feeling so overwhelmed. I especially love your idea of the sticky note with the main point of each part of the mini lesson. If people can’t find actual colleagues to read the Units with, there’s always our Twitter PLN! This is such a great post! I have approached reading the units in much the same way. If I read ahead over the weekend, my post-it notes make the lesson come alive for me again when I arrive at the lesson. I am a writing coach and have struggled with how to encourage teacher who complain about the necessary reading involved in the unit. Tomorrow we have a workshop for teachers to create toolkits for each unit. Guess what I will make sure to share? I need to dive into a new UoS book this week so this comes at the perfect time. Thanks for this insightful post, Beth. You’ve just helped me make a better use of my summer and hopefully a more productive read of the units! Thank you so much for this post! It will be so helpful to so many teachers. We LOVE that you emphasized that these are not meant to be a script!!!! We are on year two as a site of “tackling” the Units of Study. I think a lot of our staff started and stopped because they were overwhelmed by the volume of information. Three of us are headed to New York next week for two weeks in part in an attempt to head up teams for staff development next year. This is exactly what I was hoping to come away with! Thank you so much for sharing your experience and expertise. Great list of things to think about. I often also talk about the evolution of the units and the fact that they were not previously “grade level” specific in their first iteration but are now when we consider meeting the grade level expectations of the Core. I love Lucy’s explanation that the first year needs to be about “using” the lessons (adding in own stories/explanations) so that a teacher can collect data on what students’ response is before adding or deleting lessons in year two. We found that we did need to consider using “bends” from previous years to fill student gaps in knowledge/ experience as well. Thanks for the visual of your notes. That will be helpful for many! Thanks Beth! 50 LPS teachers signed up to read the UOS in grade level teams this summer, this post is helpful and timely. Thank you for this! So helpful and validating! We love the new Units! Thanks! This is a great post. I am so excited to be attending the writing institute next week in New York and this is just what I need to get started. I’m glad you talk about teachers doing the assignments themselves. I did a presentation at a conference with a friend about this and you would be amazed as to how many teachers just read out of the book. I love reading your posts. Thanks for sharing your enthusiasm. Oh how I love this post! Thank you!!! These tips are great and very helpful! Elizabeth, I like so much about this post. It puts work units into accurate perspective. Plans do guide our teaching, but they must be viewed as flexible documents. The words are not set in concrete. You also suggest teachers do the work they expect students to do. This is absolutely vital in understanding the challenges young writers face. It is where credibility dwells. I commend your words and will be promoting it to the teachers with whom I work. Your post is timely as they are currently planning for a new term. Reblogged this on aileenhower's Blog.